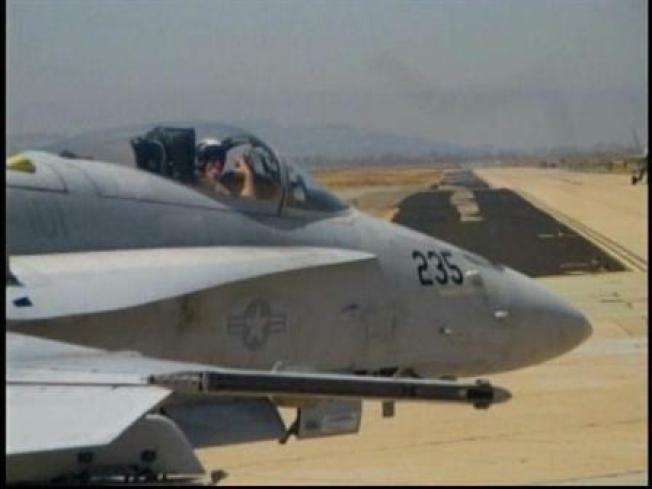 Pilot wanted to be shot down over U.S.
Two fighter jets chased after a stolen Cessna that wouldn't land. WAUSAU, Wis. – A man suspected of stealing a plane in Canada and flying erratically across three states was trying to commit suicide, hoping he would be shot down by military fighter planes, a state trooper said Tuesday. Adam Dylan Leon, 31, was arrested at a convenience store in Ellsinore, Mo., shortly after landing the single-engine, four-seat Cessna on a rural Missouri road Monday night, ending a six-hour flight, police said. The plane was tracked as a "flight safety issue" and was not believed to be a terrorist threat, Mike Kucharek, spokesman for the North American Aerospace Defense Command, said in a telephone interview from Colorado Springs. The Missouri state trooper who arrested Leon said on ABC's "Good Morning America" that the pilot told him he had hoped to be shot down. "He made a statement that he was trying to commit suicide and he didn't have the courage to do it himself. And his idea was to fly the aircraft into the United States, where he would be shot down," Trooper Justin Watson said on ABC. The single-engine, four-seat Cessna was intercepted by U.S. fighter jets over Wisconsin, where it prompted the evacuation of the state capitol, but kept flying south after the pilot failed to respond to radio calls and other signals. Many workers had already left for the day. Wisconsin Gov. Jim Doyle was not in the building. He had been in Chicago Monday. Kucharek said the Cessna 172 was stolen from Thunder Bay, Ontario, about 2:30 p.m. Monday. It landed about six hours after the reported theft, and had enough fuel for about eight hours of flight, NAADC officials said. The pilot didn't communicate with the fighter pilots from the Wisconsin Air National Guard who intercepted the plane at the Michigan-Wisconsin border, Kucharek said. Leon had acknowledged seeing the F-16s but didn't obey their nonverbal commands to follow them, Kucharek said. "We tailed it all the way," Maj. Brian Markin said. "Once it landed our aircraft returned to base."